An amazing Christmas gift was given to me this year – something that I had wanted for a while, but hadn’t been able to realize. I now have my own place to work at home! I have an office set up that is all mine which will allow me the opportunity to do more writing in my spare time. This refuge is truly that – a serene place with a desk, bookcase, a bulletin board for ideas and inspiration, as well as a door to close if I need to work without interruption. I am grateful beyond belief for this gift. It was inspired by two things – one, a book that Lori gave me by Elizabeth Berg called Escaping in to the Open – The Art of Writing True, about becoming a writer. In it, she recommends a place where you can work that will stay set up and be ready whenever the mood strikes. The second was a visit to The Container Store earlier this month where I saw desks and supplies that made me long for a place of my own. The execution was all Seth! He put it together in a part of our guest room / Trey’s room that is just perfect. I feel settled already and working here is a delight. I have a window that looks out in to the trees of the greenbelt and I feel as though I am perched in a tree house. The sun filters through the branches and plays on the boughs of the evergreens. Squirrels skitter through on their highways to and from home and birds make themselves known by their calls. I am able stare into space and see the story in front of me, wrapped in the green comfort of home. Even the rain feels soothing. I have set some writing goals for myself and am planning to work on a couple of ideas that have been on my mind. I can’t be sure they will work, but I am positive of one thing – I know they won’t if I don’t try. Here’s to 2012 and the year of possibilities. I am confident that this year will bring good things. 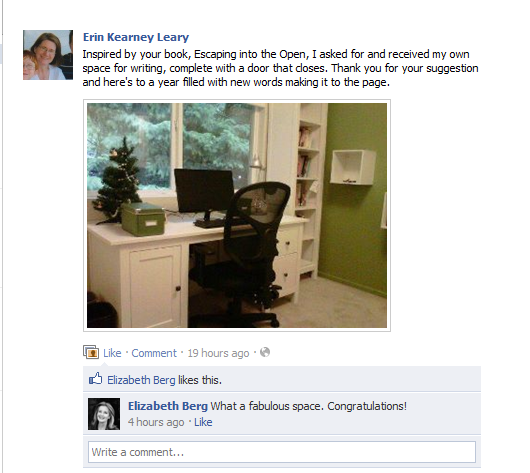 This entry was posted in Family, General Rambling and tagged Elizabeth Berg, Escaping into the Open, writing. Bookmark the permalink.